You can make the "Save As..." menu item more visible and easier to use simply by giving it a different keyboard shortcut. 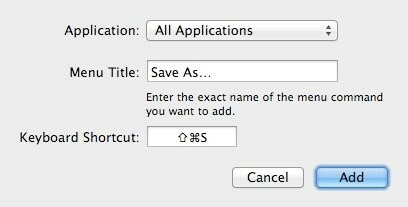 Apple did such a good job hiding "Save As..." that many smart and knowledgeable Mac users still don't know that 'Save As...' exists in Mountain Lion. Fortunately for us, there is a very easy way to make "Save As..." more visible: just change its keyboard shortcut. I'm going to show you two different ways that you can do that (you only need to choose one). Launch TextEdit and open the 'File' menu and you should see "Save As..." back in its rightful spot with its original Command + Shift + S shortcut, as shown in the image above. and look for "Save As..." = "@$s"; in the output. Option 2. System Preferences.app If you would rather not use Terminal, it's still very easy to add the keyboard shortcut. 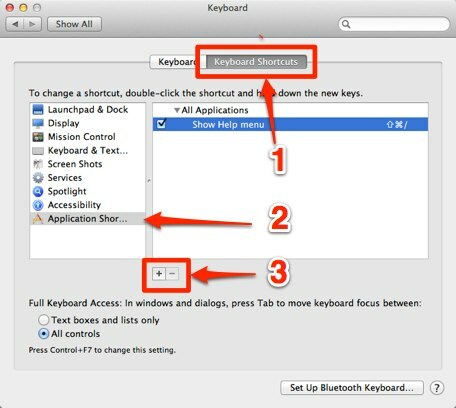 Launch the System Preferences.app, then open the "Keyboard" preference pane. Once you press that "+" button, a small window will appear asking you to enter the title of the menu item and the keyboard shortcut that you want to use. Note: It used to be true that you had to enter an actual ellipsis (which you can get by pressing Option + ; on a US-English keyboard). However, when I tested this in Mac OS X 10.8.2, it worked with three consecutive periods. Bonus Tip: Hide the "Duplicate" menu item. In my original article I suggested that you also enter a keyboard shortcut for "Duplicate" and while you can do that if you wish, you do not need to do that. However, if you would like to hide the Duplicate menu item, you can do that. There are two steps: first, remap "Save As..." to Command + Shift + S (as shown above). Then the 'trick' is to remap "Duplicate" to Command + Shift + Option + S.
What you will have done is swap the keyboard shortcuts for "Duplicate" and "Save As..." which means that OS X will make "Duplicate" the optional command. 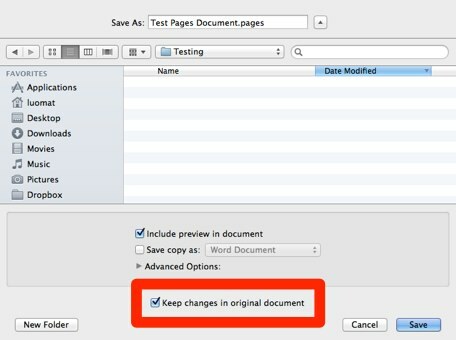 If you open the "File" menu and hold down "Option" the "Save As..." command will change to "Duplicate"
Important Addendum: "Keep changes in original document"
As we reported in August 2012, the "Save As..." command in early versions of 10.8 had an unexpected and likely unwanted side effect in Mountain Lion: it would save the changes in the new document (created by "Save As...") but would also save the changes to the original document. Option A: If you want to save the changes you've made in the document and then save the document with a different name, then make sure that the box is checked. Option B: If you want your original document to stay as it was when you last saved it and create a new document based on the modified content of that document, then make sure that box is not checked. If you do not see the 'Keep changes in original document' box, then the application is probably going to give you the "Option B" behavior, but if you are not sure, I would suggest choosing Cancel in the "Save" dialog, then copy and paste the contents of the document into a new file, and save the new file. I know that's several extra-and-less-convenient steps, but if you are worried about preserving the original document, better safe than sorry. You could also save the file, duplicate it in Finder, and rename the new instance. Open old file and revert to previous save using 'Versions'. Frankly,I wish that Apple had just left the "Save As..." command alone, but for some reason they didn't ask my opinion. That said, I'm glad that they brought it back in Mountain Lion. I would have paid $20 for that feature alone. Note: This article was re-written and republished on 2013–02–21. The original process still works, but I wanted to update it to reflect some additional information. Read the previous version at web.archive.org.